Kesari is the easiest sweet in all to prepare and delicious to eat, we can make this method of preparation in Semiya, Varagu rice, Aval (flatten rice) and much more to enjoy the taste of this kesari in a different base ingredient. We never bored to taste it. 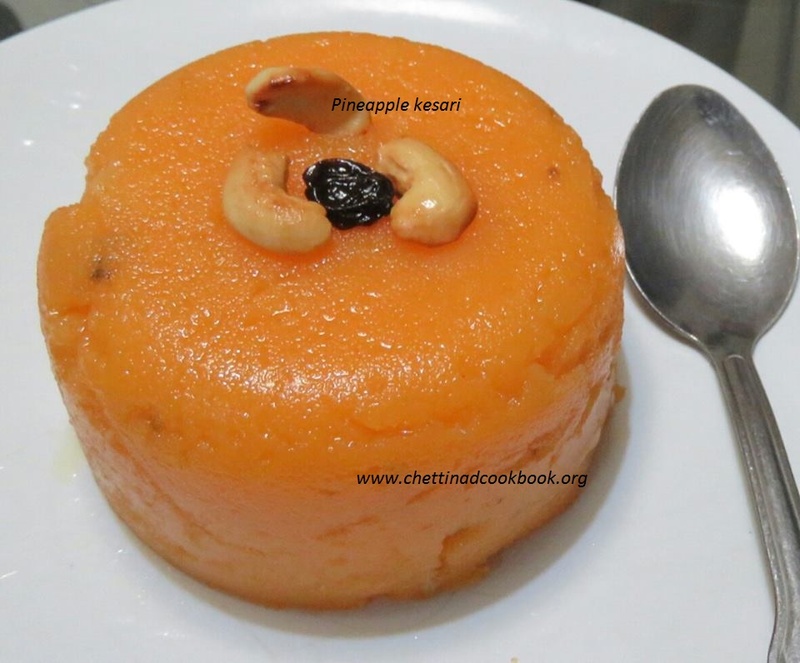 Here we have fruit flavoured recipe with Pineapple or banana this will be aromatic and delectable with the fruit bite. 1.Heat 1 tbsp of ghee and brown roast cashew and kiss miss collect and keep aside. 2. 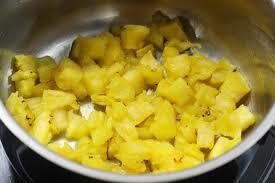 Roast sliced pineapple in the same ghee till it gets half cooked for 3 minutes approximately. 3. Now roast the measured sooji in ghee for 3 to 5 minutes in medium flame stir. 4. Boil water, add food colour, roasted pineapple slices and a tbsp of ghee, now add roasted sooji in the boiling water and mix constantly allow it to cook soft . 5. Reduce flame, gradually add measured sugar to it, mix well without any lumps. 6. Let the mixture coagulates and cook well for two minutes, add rest of the ghee to it. 7. Finally, add elaichi powder and roasted cashews. Aromatic and delicious pineapple kesari is ready. Reduce flame while adding sugar to avoid forming lumps mix well and increase the flame gradually. Pineapple can be alternated with banana. Add boiled water to cook sooji.